I've had Joanna Copestick's The Family Home on my inspiration shelf for several years and pull it out every few months to drool over. The photographs are of real homes and families, which is nice, and I enjoy the five or six sections distributed through the book where she profiles a family in more detail, with lots of photos. Especially the ones with Aga stoves (everyone's English). This is a decorating book that's honestly geared towards setting up a delightful home with children, unlike so many others. The author even offers her suggestions on what to make children for supper. This is a substantial, glossy hardback book that's available used for very little. Well worth it! I'm proud to have figured this one out, after many years of mediocre pot roasts. Secret #1: Ditch the Crock-Pot. I know, I know, the convenience. But it just does not make as good of a pot roast as. . .
Secret #2: Using a cast iron Dutch oven. On the stovetop. Which is really just as convenient. Today, for instance, I put my meat in the pot and left the house for several hours, until right before dinner. Everything was fine, just like it would be in a Crock-Pot, but oh those superior results! Secret #3: Brown your (salt and peppered) meat in a little olive oil, remove it from the pot, then brown a cut-up onion, a red pepper, and several crushed cloves of garlic. Put the meat back in on the vegetables and add a can of broth and a cup of wine if you have it, or a beer. Put the lid on, bring to a boil, then turn down as low as it will go. The beauty of this method is the melting tenderness of the meat under the caramelized outer crust, and the magically thickened sauce that appears at the end of the cooking. Secret #4: No more chuck roasts. It's bottom round, baby. Costs more, but has more meat and less fat. You'll throw less away, and it's less stringy, slices beautifully, and goes farther. Secret #5: Peerless gravy. Remove the vegetables with a slotted spoon and toss. Bring the pan juices to a boil. In a small jar, shake together about 1/3 cup water and 2 T. flour. Slowly pour into pan, and stir and simmer until smooth and thick. This is truly ambrosial gravy. Those are my secrets. Enjoy. Cleaning the refrigerator is one of those chores that I find hard to fit in to my regular schedule during the week. But today was a rainy Saturday, the Composer was gone for the day, and I had big kids to help entertain Daisy and also take my musical requests and DJ for me as my hands were sudsy--so I plunged in. Actually, the fridge stays pretty clean these days. I attribute that to planning meals a week at a time. Having a written plan to remind me what I was going to cook goes a long way toward avoiding the nasty mess of produce getting old in the crisper drawer. In the old, more spontaneous days, I would forget what I had down in the bottom or the back of the fridge and fail to use it up in time. Which reminds me, in a tangential sort of way, of the time my friend Carol "lost" a pot roast in her van, in the summer. She went to cook it and couldn't find it, then checked her car. It announced its presence. Anyway, having a list in front of my nose of what I'm cooking is very helpful to me and to my fridge. I've also started fixing a big stir-fry, pot of soup, or crudite platter the day before grocery day, to clean out all the tidbits from the week before. I got everything clean and shining and ready for a week's worth of groceries, which is a nice feeling.
. . . and have reconnected me to the internet (thank you Giles). Sigh. I never liked dusting because I never felt like I was making anything actually cleaner, until I met the Microfiber Dusting Cloth. These things are so great, wet or dry, because they seem to make dust jump off the furniture and stick on the cloth. The vast quantities of dust I pick up with them are heartening. I *know* the house is less dusty when I can see so much dust on my cloth. My favorites are my two cloths made by Scotch-Brite and designed for doing dishes--they're a sort of waffle weave. The texture helps them pick up even more dust than my flatter ones, and when they're wet they're great scrubbers. I'd like five or six more. This is a very dusty house. It's true--the house is quiet. 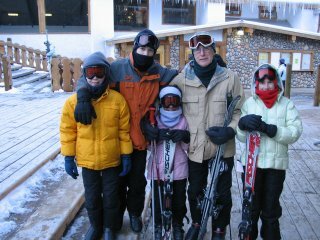 The big kids are off on a trip, outfitted with long underwear and neck gaiters: tomorrow morning they hit the ski slope. Daisy and I are redeeming the time as best we can. I had court this morning so Daisy went to visit my friend Carol who has a two-year old boy. Daisy was on her best behavior and inspected an outstanding number of toys and books. I was glad for both Daisy *and* Carol, since sad babies are really no fun. I had the pleasure of seeing the judge close two of my cases today (I represent parents whose children are in foster care). Today two of my families had made such excellent progress that their cases were entirely closed. 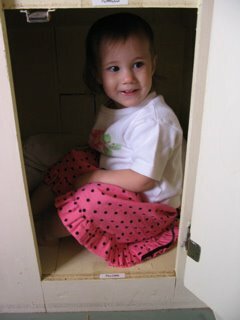 One mother in particular had really turned her life around and I was very happy to see her succeed. Meanwhile at home, we are undertaking some extra sewing (I finished a white linen blouse yesterday, very nice! 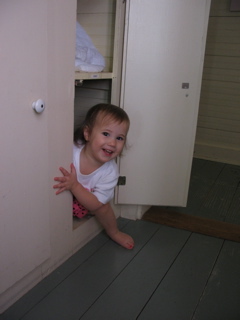 ), some extra cleaning, and we are *not* cooking big meals, or doing any kind of homeschool! Very restful. I'll be climbing the walls by tomorrow night. I find the bake-a-thon to be a more complicated mental process than a straight cook-a-thon, as so many of the items have overlapping ingredients and it's easy to forget whether or not I have added salt--or even flour or sugar!--to a particular bowl. Everything from this morning looks okay, although I'm not as blissfully confident as I was back in the days before I produced a beautiful but horrible-tasting chocolate cake with no sugar in it! Here Daisy sports her newly created "Best in Show" dress, made from the Sense and Sensibility's Girls' Regency Dress Pattern. The cozy flannel features dogs in ice skates, and the bodice is adorned with an ivory grosgrain rosette and trailing georgette and satin ribbons because, obviously, Daisy *is* Best in Show. I made this in a size 2 and it is a little large through the shoulders--actually it slips off in a most provocative fashion--so it will mostly be for next year. If I make another dress from this pattern this year I will place the front and back bodice pieces off the edge of the fabric about 3/4 of an inch to draw the shoulders closer together. If I ever notice that it's been a while since we've been sick, that's usually a sign that someone's coming down with something contagious. Yesterday I was miserable with a bug and spent the day sleeping and pawning Daisy off on her brothers and sisters (who were very nice about it). I only had the energy to pull out a few bags of chicken bones and vegetable scraps from the freezer and put on a huge pot of chicken broth. This morning I was back to normal and very grateful for the vast quantities of broth as three others were down ill. All were happy to receive trays with mugs of broth and plates of toast. Fortunately it seems to be a 24-hour virus, as we are now down to two and a half days before the ski trip, and the Composer, who will drive, has joined the ranks of the suffering. "The Center of Our Lives"
"Our homes are the center of our lives, and we should allow time and resources to mke the most of them that we can, and to care for them in a way that consolidates and elaborates their meaning for each of us. At a minimum, we should avoid thinking that time spent on our homes is wasted time, or that our goal should always be to reduce the time and effort we spend on them." --Cheryl Mendelson's Home Comforts, Chapter One. "The Least Alienated Form of Work"
"Modern housekeeping, despite its bad press, is among the most thoroughly pleasant, significant, and least alienated forms of work that many of us will encounter even if we are blessed with work outside the home that we like...housekeeping actually offers more opportunities for savoring achievement than almost any other work I can think of. Each of its regular routines brings satisfaction when it is completed. These routines echo the rhythm of life, and the housekeeping rhythm is the rhythm of the body. You get satisfaction not only from the sense of order, cleanliness, freshness, peace and plenty restored, but from the knowledge that you yourself and those you care about are going to enjoy these benefits." "An Extension of Her Body"
"...What a traditional woman did that made her home warm and alive was not dusting and laundry...Her real secret was that she identified herself with her home...her affection was in the soft sofa cushions, clean linens, and good meals; her memory in well-stocked storeroom cabinets and the pantry; her intelligence in the order and healthfulness of her home; her good humor in its light and air. She lived her life not only through her own body but through the house as an extension of her body; part of her relation to those she loved was embodied in the physical medium of the home she made." Actually, Daisy did most of the work. This morning I pulled out all my big pots and pans and got down to business, cooking food for the Composer and the big kids to take along on their ski trip next weekend. They will be gone five days while Daisy and I stay home. We have never been skiing before but it seems like the kind of thing that will make you hungry. Giles has a really serious dairy allergy and it is hard for him to find food that obeys the rules of Truly Dairy Free. So I'm sending food. It's all plain and serious food, but I wanted it to be a) filling and b) easy to heat and serve. I did all that in (drumroll, please) an hour and a half! Each dish will serve about 12 people. That's about right for my family of big eaters and two other adults with slower metabolisms. Giles is a vacuum, even when he's not skiing. 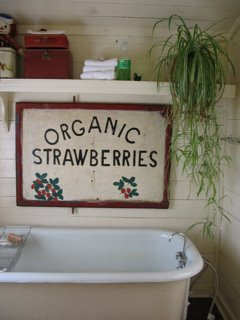 I must cop to having a theme room in my house--the Strawberry Bathroom. I realize that a room like this skates perilously close to being Country with a K, but this was not my invention but my inheritance from my family of origin. Many many years ago the tole-painting neighbor was allowed in with her art supplies, and that's where it came from. There are strawberries painted around each of the two windows, and they really are cute. For about twenty years there were enormous (ten inch!) 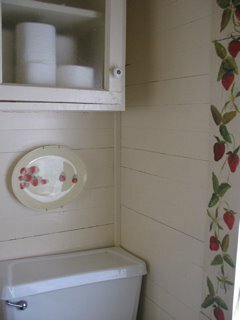 strawberries painted on the side of the tub. Those are gone now. Whew! Then several years ago I was poking around an antique store in a really little town and found the huge metal sign. The dimensions were a perfect lucky fit and who could argue with the sentiments it expresses? So it came home with us and found a spot beside the tub. But that's a far as I will go. No strawberry towels or knickknacks, but some yummy strawberry glycerine soap might be nice. Giles and Felix have been hard at work building a coop for hens they plan to buy. They are cleverly managing with nothing but found materials, thus keeping their overhead way down. The floor of the coop is gorgeous unplaned cedar 1 x 10 boards, and apparently the hens will be laying in a nesting box made of an antique cupboard that I didn't know was in the barn. I will be thrilled to have a source of fresh eggs so close to home, and look forward to introducing Daisy to some friendly hens. I have never had any *nice* wood floors to take care of, as my wood floors are more along the lines of bare pine planks, painted pine planks, or floors that used to have paint on them and now have bare paths where the foot traffic goes. I like these floors because you know, anything goes. I can vacuum, dust mop, or mop with soapy water, and nothing bad will happen. Or I can do like I did when I have four children under the age of six--nothing at all. Just ignore the huge pileups of dirt and be thankful that the kitchen and dining room floors were *supposed* to be dirt-colored. I have to say that my standards have risen somewhat in the intervening years. I turned to the encyclopedia of all housekeeping knowledge, Home Comforts by Cheryl Mendelson, to see what she has to say about caring for wood floors. It turns out that she recommends that all wood floors be vacuumed, as the semi-sticky grime won't come off any other way. "On bare floors and delicate, antique, and Oriental carpets [not applicable! ], use the bare-floor vacuum attachment, or what some manufacturers call the 'universal' floor attachment. . .the little rubber wheels prevent it from scratching the floor." She further recommends occasional mopping with a barely-damp mop. That is the real floor-cleaning protocol, for those homemakers whose children are over the age of five; everyone else is excused. 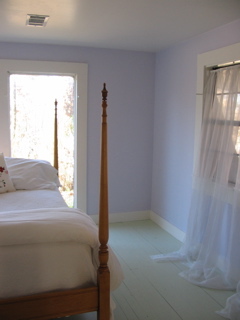 I love this cool shade of lavendar, and as you can see, have used it in the master bedroom. There are few corners of my house as monastically empty as this one, but I do love the bare space in our room. The large windows face west, and in the spring and summer we wake up looking directly into the leafy branches of a huge persimmon tree. The Composer is not a man who spends a lot of time cooking, but once in a blue moon he makes crepes for us. That's such a man thing to me--seldom cook, but when you do, make sure it's something memorable! His German mother used to make these for him, and they are such a treat. Sometimes we have them like Grandma Helga made them, filled with jam and sprinkled with sugar. Other times we cook a thick blackberry or blueberry filling (easy--frozen fruit, a little sugar, and thickened with cornstarch), and top them with whipped cream. Last night only the girls were home with us, and he got busy in the kitchen. Clara ate five, Bella ate five, and that left two for him and none for me. I hope he makes them again soon. The kids don't watch any tv (the Composer and I watch only ER), and we hardly get any reception anyway, but this past year we have been tickled with our DVD purchases of some of our old favorite series from growing up. We have Andy Griffith, I Love Lucy, Happy Days, Brady Bunch, and a few other odds and ends, but the hands-down favorite with the children is Gilligan's Island. Bella is the proud new owner (since Christmas) of Season Two, which we are enjoying every day. When I first watched it as an eight-year old myself I don't think I quite fathomed the depths of silliness of the show, but boy it seems silly now, and I do love to hear the uncontrolled tickled laughter from the kids as they watch. 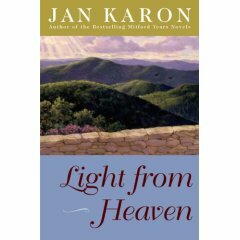 As we are all enormous fans of Jan Karon's Mitford novels, we began Light from Heaven, the series finale, with every intention of enjoying ourselves. I say we--Giles, Clara, and I took turns, and Felix is next in line. In fact, the book lived up to my expectations: lots of good food, loveable characters, and many reminders of God's gracious providence. All of the Mitford mysteries were at last revealed, thank goodness. It's true that a good sharp editing would have improved the prose, but in spite of that, Light from Heaven was a winner. 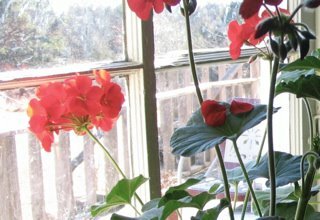 My geraniums are lovely now. I'm surprised that Daisy still hasn't figured out that there are pots of dirt down at her level, right there by the dining table. Blend until well-mixed, even kneading towards the end to get a nice smooth dough. Roll out on floured surface about 1/2 inch thick. Cut in donut shapes and fry in two inches of medium-hot oil. You want it hot enough to sizzle going in and not take too long to get nice and brown, but not so hot the outside gets too brown too fast. You'll know it when you see it. Donuts will rise when they are ready to be turned--they are so helpful! When cool, let powdered sugar fall on them through a mesh strainer or sifter; it's fun. Great for feeding big hungry boys. In all these years, I have never messed with sourdough. It seemed too much like getting a puppy. How will I go on vacation? Who will feed it? What if it pees on the rug? Everything changed today. The ever-resourceful neighbors (my source of fresh eggs) brought over some starter. It only needs to be messed with once a week, which doesn't seem unreasonable. I fed it this morning and then baked a loaf for dinner, which turned out like real sourdough bread! I used about half wheat and half white flour. The instructions I was following were very unclear as to how much flour, and next time I will put in much more, until it feels right to me. This time my dough was way too slack and I ended up baking a large round flat foccaccia, ungainly but tasty. I'm looking forward to trying again, and if it doesn't work out, I can always take my starter to the pound. This year we gave up on having grown-up fun and went for a great New Year's Eve for the children instead. Every child got to have a friend over to spend the night, and we put in the time til midnight playing games, making raspberry ice cream, and watching multiple episodes of Gilligan's Island. I had also made donuts earlier in the evening to have as snacks and they were so good! They are about as hard to make as biscuits--the only difference is frying them, which is the fun part! I just use my cast iron Dutch oven with about two inches of oil in it, and they only take two or three minutes per batch. I let them cool on a towel, then sprinkle with powdered sugar shaken through a wire mesh strainer. The evening went off with only one hitch, about which the less said, the better. I will note that the Composer's New Year's resolution as expressed on the way to church, was "to not have anyone over to spend the night who is going to throw up."